Love Star Wars? Missed out on tickets for The Force Awakens on opening night? Or maybe you HATE Star Wars? Want to escape the onslaught? We’re excited to announce that Matchbox’s final screening of 2015, on the very day Episode VII arrives, will be Spaceballs (Mel Brooks, 1987). Comedy legend Mel Brooks leads an all-star cast including John Candy, Rick Moranis and Bill Pullman in the original Star Wars spoof. 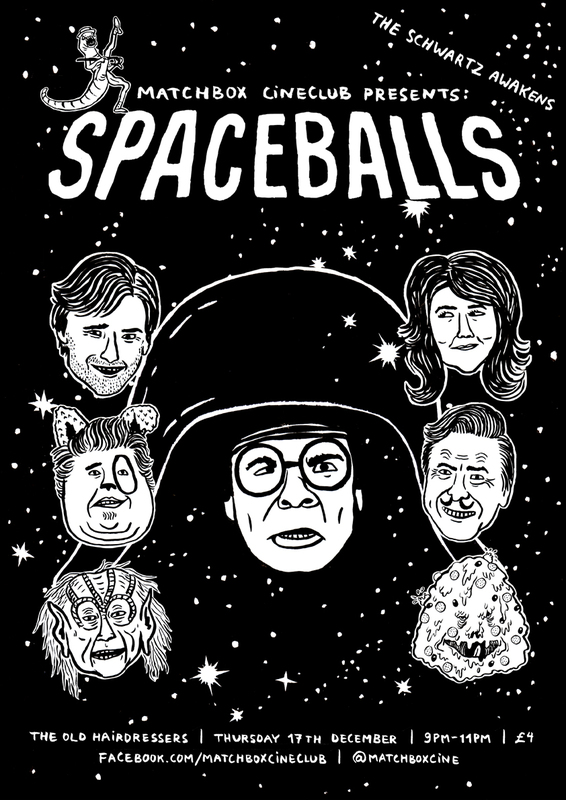 Our Spaceballs screening takes place on Thursday 17/12, at The Old Hairdressers, Glasgow. When the evil Dark Helmet (Rick Moranis) attempts to steal all the air from planet Druidia, a determined Druish Princess (Daphne Zuniga), a clueless rogue (Bill Pullman) and a half-man/half-dog creature who’s his own best friend (John Candy) set out to stop him. But with the forces of darkness closing in on them at ludicrous speed, they’ll need the help of a wise imp named Yogurt (Mel Brooks) and the mystical power of “The Schwartz” to bring peace and merchandising rights to the entire galaxy! The screening is by arrangement with Park Circus Films. Stay up-to-date via the Facebook event page, here. Tickets available via Eventbrite, here. This entry was posted in Glasgow, Matchbox Cineclub and tagged 1987, 2015, Bill Pullman, Cinema, Comedy, Cult, Episode VII, Film, Glasgow, John Candy, Matchbox Cineclub, Mel Brooks, Movies, Parody, Preview, Rick Moranis, Spaceballs, Spoof, Star Wars, The Force Awakens, The Old Hairdressers. Bookmark the permalink.